Happy one year running anniversary to me! My weekend started with the Run for the Cheetah 5k on Saturday morning. I did the run last year as my first ever race. It was nice to arrive this year feeling almost like an experienced race veteran. (Last year, I was such a newbie that I had to ask what to do with the timing chip.) 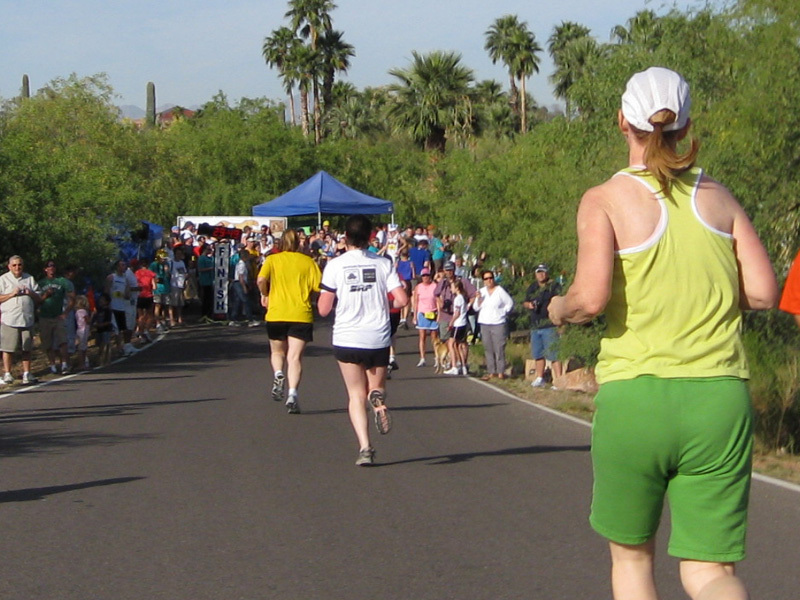 Whenever I do a race at Papago Park, I try to park near the ranger station so I have easy access to the bathrooms. As at most of my recent races, I used the walk from the car to the registration area as my main warm up. We started on time at 7:30am. This year the race wasn’t chip timed, and it took about 15 seconds before I crossed the start line. My goal was to finish in 30 minutes so I figured I’d try to stay at about a 9:30 pace. It was so crowded for the first 200 yards inside the park that even if I wanted to, I couldn’t have gone that fast. Once we got out to the canal it was better. I looked at my Garmin a lot. I have no idea how to run a consistently steady 9:30 pace, so I mostly just checked to be sure I was somewhere between 9:00 and 10:00. My pace probably waivered a lot because of the photos. I didn’t want to stop or walk, so I just took A LOT of photos, figuring that at least a few had to be good. 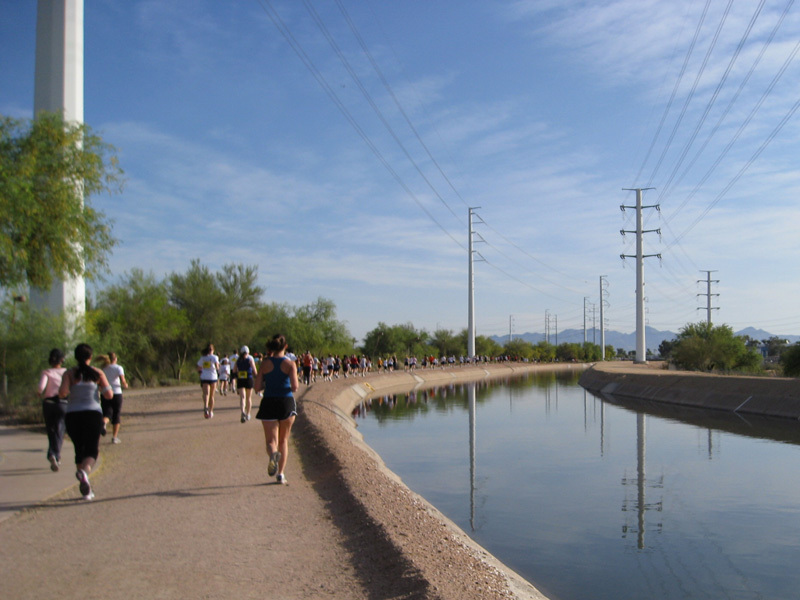 The one below is my favorite because of how it shows the line of runners along the curve of the canal. Looking back, I probably should have just carried my camera the whole time instead of continually putting it in and taking it out of my waist pack. I took one last photo as I was coming in to the finish. Zooming in really close on the photo shows that the clock reads 29:59. I sprinted for the finish in order to try and make my goal of 30 minutes. I thought I crossed the line right at 30:00, but the official results have me at 30:01. (And they didn’t even get my name right!) Although if the race was chip timed, then I would have been under 30. Oh, well. I stuck around after the race waiting for the raffle drawing. I didn’t win in the raffle, but I did get my photo taken with the Red Robin mascot. 🙂 I also ended up taking home quite a few goodies from the race: four packages of Clif Shot Bloks, four bags of Popumz, a couple REI coupons, a Jamba Juice coupon, and some Red Robin bird bucks. And… I got free admission to the Phoenix Zoo for the day so Troy and I went back later in the afternoon and wandered around for a couple hours. Not bad for a $25 registration fee. Hey, thanks for the bondi band suggestion! I will definitely check those out because my hair is a FREAKING MESS these days. Happy one-year running anniversary. That is AWESOME! This looks like a good race. I’ll have to put it on my schedule for next year. Random question for you. 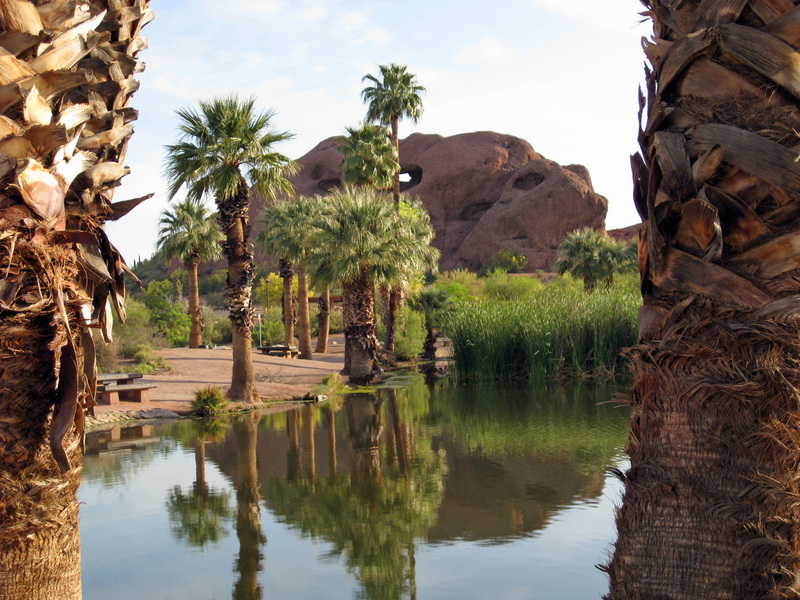 Do you happen to recall the website for the Phx Zoo picture? I ran the Walk in the Wild 5k at the zoo this morning and they were there taking pictures, but they didn’t give me a card to go look it up. If you do, could you pass it on to me? Thanks a million!